Processes up to 1m of rope per second. It has diameter and speed controls, stopping and starting device, and height adjustment. Powered by two hydraulic motors, OMP 50 and OMN 32, made of stainless steel. Socking of mussels with center core rope and Spanish style cotton socking. The unit can be mounted on a boat in conjunction with other machinery (access ramp M-501, stripper hauler M-500, de-clumper M-502, 513) to process continuous longlines. The spanish continuous socking machine can be used on its own as well, in cultures such as non-continuous longline and mussel rafts. The machine is fairly low-tech, easy to install and use, and virtually maintenance free. Small and light-weight. Has speed, diameter, and height adjustments. 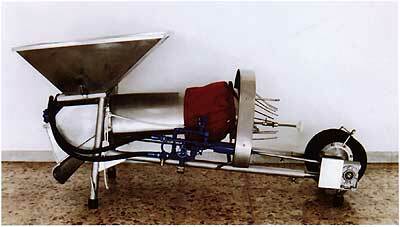 Produces a rope with mussels distributed uniformly along it, quickly and efficiently.